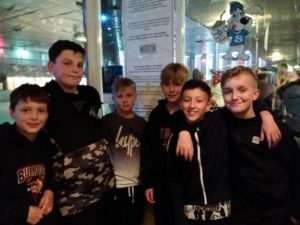 "who let the dogs out…….National Champions 2015"
Bradford Bulldogs Under 13s enjoyed a trip out to Laserzone and Bradford Ice Arena on Sunday 9th July. The event was organised by Assistant Manager, Leanda Smith, to celebrate the end of a good season for the team and to help with team building. To the right are some of the players who took part. Copyright © 2019 BRADFORD BULLDOGS. All Rights Reserved. Tonic created by c.bavota.